Home fashion How to wear boots in the office? Boots in office seem a little not so professional but with the changing trends, boots can be worn in office too with your professional attire. There are several types of boots and not all can be worn to the office. You need to know how to team up your formal outfit with boots during winters so that you carry your professionalism well. First we need to understand how to buy boots? Choose a standard/ conservative boot preferably ankle boots that does not contain too much hardware or details such as studs, laces, etc. Keep it professional with black and brown colors. Do not pick a shiny patent leather boot. They are better off for parties. Make sure that the leather or suede is rich and classy. An appropriate heel of not more than a 3″. Not too skinny either. Semi-opaque/ opaque tights balance the weight of the boot. Do not go for the knee and thigh high boots. They’re not professional in the business. No boots with fur embellishment. It is too much for the workplace. Kinds of boots for office? While you choose amongst the boots to wear to the office. Go for the ankle boots as they are trending amongst women of all age groups and specifically for working women. 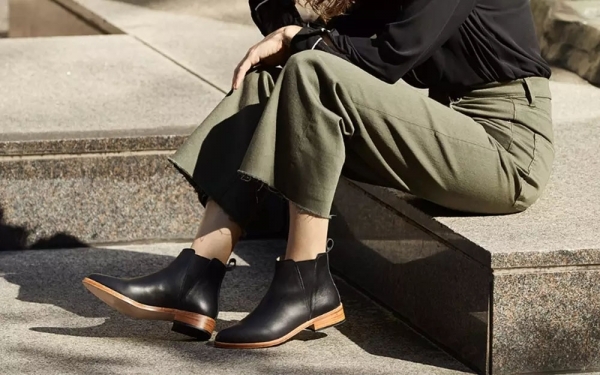 Styling ankle boots can successfully give off a professional look at the office. They are considered to be one of the most functional types of boots. They are warm, easy and are great to wear for work. But, they are a bit tricky to style and pair with different types of outfits. They are usually used for formal events and must be worn with suits and in neutral colors such as black or brown. Try to find an ankle shoe that has a decent heel size that allows you to stand and work for long hours. The shoes must be made of leather and should have a smooth and shiny finish. Minimal laced ankle boots provide a semi-formal look and can be worn to office in most companies. These types of boost can be used for both office and casual meetings. They are very flexible and can be worn on both professional and personal days. These boots have a smooth and fine look and they can go well with the business casual look. They also have a moderate heel size and provide great comfort. These types of shoes come in a range of designs of leather like the shiny, solid structure and also a textured design. Semi-formal ankle boots have a little higher heel that can be teamed up with a pencil skirt. Wear ankle boots with a formal knee-length dress. Choose a straight dress with a thick fabric and preferably with geometrical shapes and designs. The boots can be slightly heeled and you are ready for a formal party. If you are going for an executive social event then replace the short dress with a long elegant gown. This gives off a well-carved look and makes you party ready. But wear it only if you can pull it with confidence. Because boots and gowns are not everyone’s cup of tea. Also be very careful with the type of gown, it should go with your boots. Wear a pencil skirt with ankle shoes and minimal accessories. Pencil skirts go well with ankle boots and go with the corporate look without making you look too casual. Pencil skirts can be worn with a classic white shirt. Skinny or thin lined trousers go well with ankle boots. It also provides a long frame to the wearer. To look tall and stylish wear ankle tapering trousers. White shirts go perfectly with this style and add a classic touch to the wardrobe. If you want to go for the completely professional team it up with a formal jacket and you are good to go.